I have decided to move to Patreon for now and I hope to get your support there. Instead of preparing lots of models that may or may not be a hit on kickstarter, I will release often, and free. For now (and for a long time coming I hope) I really want to engage with you, my supporters. This is the most rewarding for me. It will give you lots of free terrain stl-files. So head on to Patreon and become my supporter. Just a dollar per month. Sure, you will still get access to all the terrain files that I make. But it makes a massive difference for me. On higher levels you get to vote on coming projects, early access and source file access. As of now, this page is resting. I have been playing with teespring. It’s a site where creators design clothing and other items. Teespring then sells them to the public and the creator earns money. Just wanted to share it with you if you want to support my work. I know I want a mug myself. I know these items aren’t cheap. That is because you also support me. Consider it. Also, consider my Patreon page. One dollar per month. Or three if you want voting rights. Or five if you want early access and all source files. This painting series is for people with limited or no painting skills. You print terrain on your home 3D printer and want it to look ok on the game board. I’m no expert painter and when I paint terrain I am quite impatient and don’t think about the details much. I will through this series focus on techniques that makes painting simple and quick. That is how I paint. It gives you tabletop ready terrain. 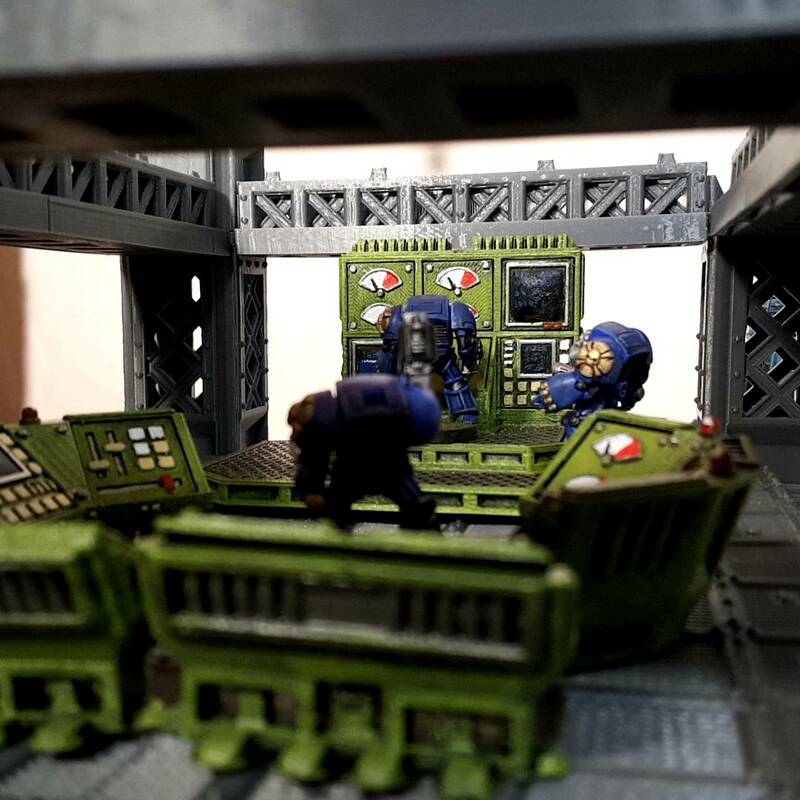 Let’s be honest here, terrain printed on a FDM printer is good for gaming, but not dioramas. Start with giving your print a base coat. I almost always paint with gray filament, since that is easiest to snap pictures of to show you guys and gals. So I always give my terrain a base coat, black or white, depending on how I intend to continue painting. I may be interested in the base coat shining through. Then I can paint it black. If I want a piece with lighter colors I will use white. Otherwise it doesn’t matter that much. I use spray paint for the base coat. Be outside, or a very well ventilated area. Wear a mask. Give the can a good shake. Hold the nozzle about 20cm (5 inch) from the piece. 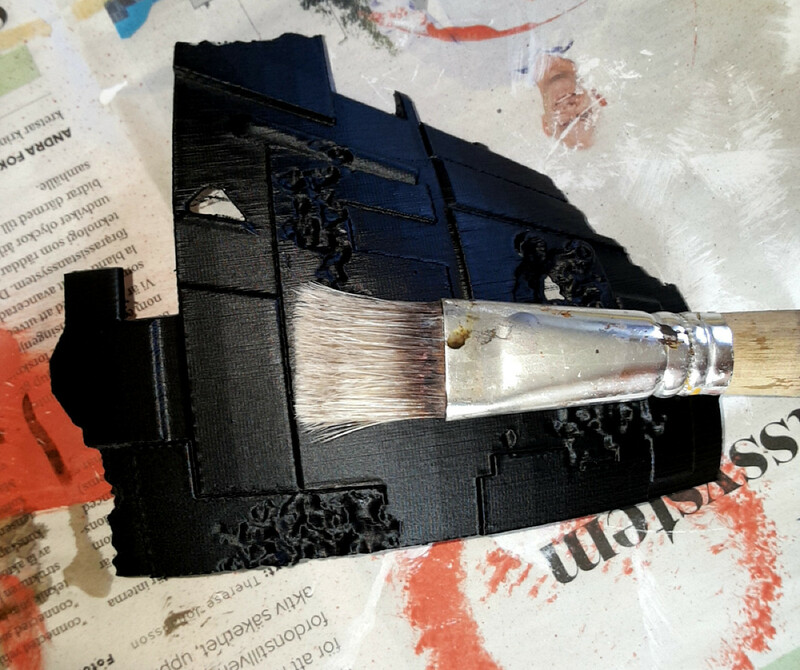 Press down and use gentle strokes back and forth over the print to paint it. It’s good to have the print on a cardboard box. You can rotate it to paint from different angles. When spray priming your miniatures, it is important to not get a thick layer of paint. That will hide the details. But with prints, you probably want to hide them. Artifacts, layering, etc. So don’t worry if you drench the print in paint. Also, since you probably will drench it in other kinds of paint later, don’t worry if the base coat is a little thin some places. It will give your piece some variation and a more natural look. It is time to pick up the brush and give the piece a basic color. If you want to make it very easy, paint it in the color you want the finished piece to be. You can of course do this with a rattle can too. But it will cost more. For this I use a big brush and house paint (emulsion or latex paint). It tends to be quite thick so I thin it down just a little with water. I usually paint over everything with this color. Details can be painted with other colors later. When you have painted the entire piece, let it dry for an hour. Then paint it again with a second layer. Let it dry again. 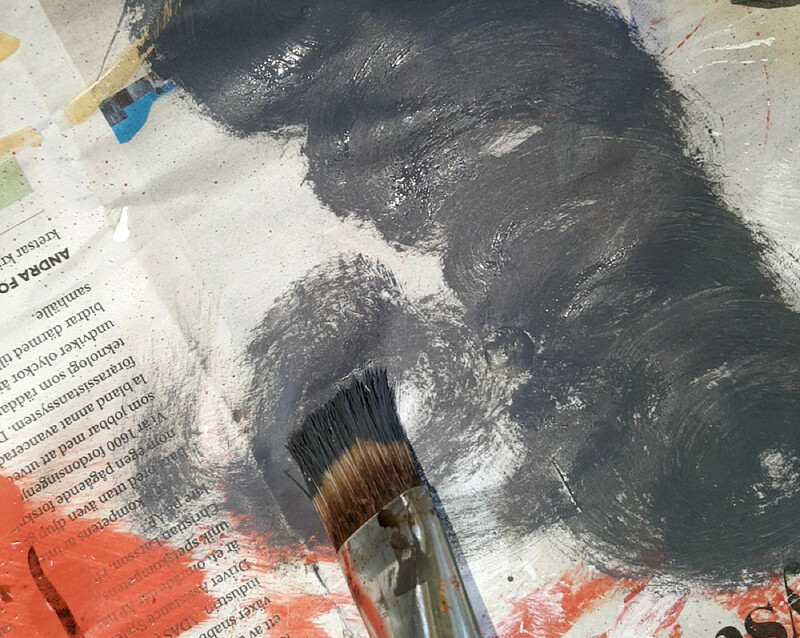 The paint can easily rest in the palette without drying out. As you can see in the pictures below the first layer isn’t covering the white 100%. Overbrushing is a technique to enhance the details of a model. The brush should not be loaded with much paint so it floods every detail. 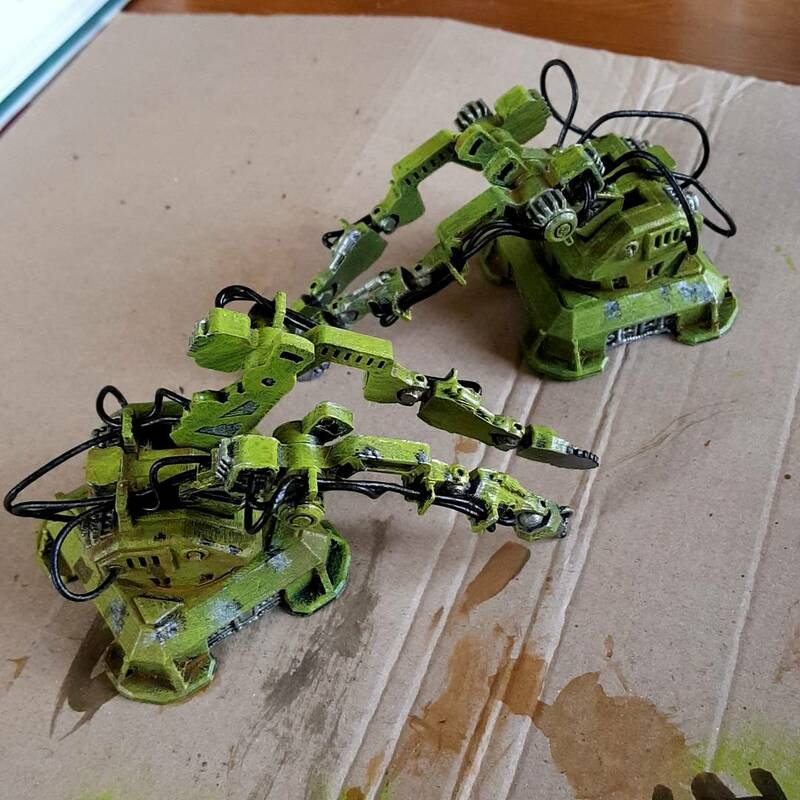 Instead, by working a small amount of paint into the bristles and pressing the brush quite hard against the surface of the model, the paint sticks mostly to flat surfaces, edges, corners and other protruding parts. Together with a dark (probably black) base coat, you will get a very nice effect with very little effort. You will probably need at least three coats to get a covering equaling that of normal painting. One advantage is that paint from overbrushing dries much faster. 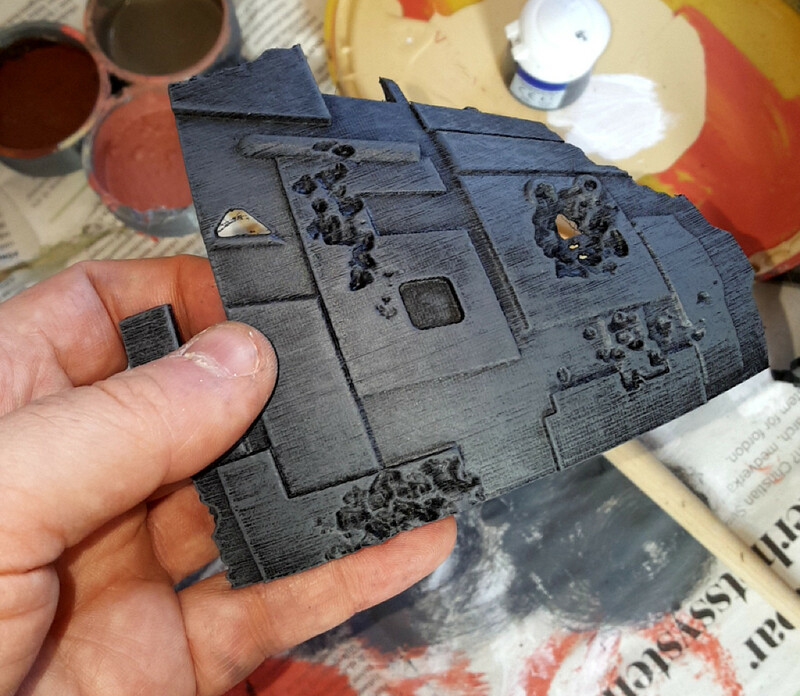 Here I have a base coated (black spray) wreckage. I want it to be different shades of gray in the end. Also I selected a brush that was good size for the details. I loaded the brush with lots of paint. Then started working it into the bristles. This makes the brush dryer and dryer. When I start to pick out brush streaks on the newspaper, the brush is ready. Then I brush all over the model until I am happy. See how the model has lots of definition already. I will work more with this but it could be ready for the tabletop. As I announced some time ago, I have opened a Patreon page. How does it work then? You donate a small (or large) sum to me every month. The site Patreon helps you with that. I publish lots of free terrain. It will be free for everyone, not just the patrons. Patrons get some extra though. I will continue to have my shop open for the time being. I judge it would not be fair to my previous buyers if things the purchased some time back suddenly was free. It may be free after a long cool down time, like a couple of years. I have a home made photo studio. It’s a big cardboard box with two sets of LED strips around the walls and ceiling. It’s not pretty but it produces nice photos. As you can see, the background is taped together. Some time I will make a bigger print (2D on paper), probably a sky, to have as background. I want to spread my designs as far and wide as possible. Making each of you purchase them is counter productive for that. I’m a big fan of open source and I’m planning for my designs to be Creative Commons. I want to have a quick release cycle. Constant feedback and quick improvements. I don’t want to prepare a huge amount of work to launch a kickstarter. I want to make something and release it. I really hope you want to help me make this a reality. 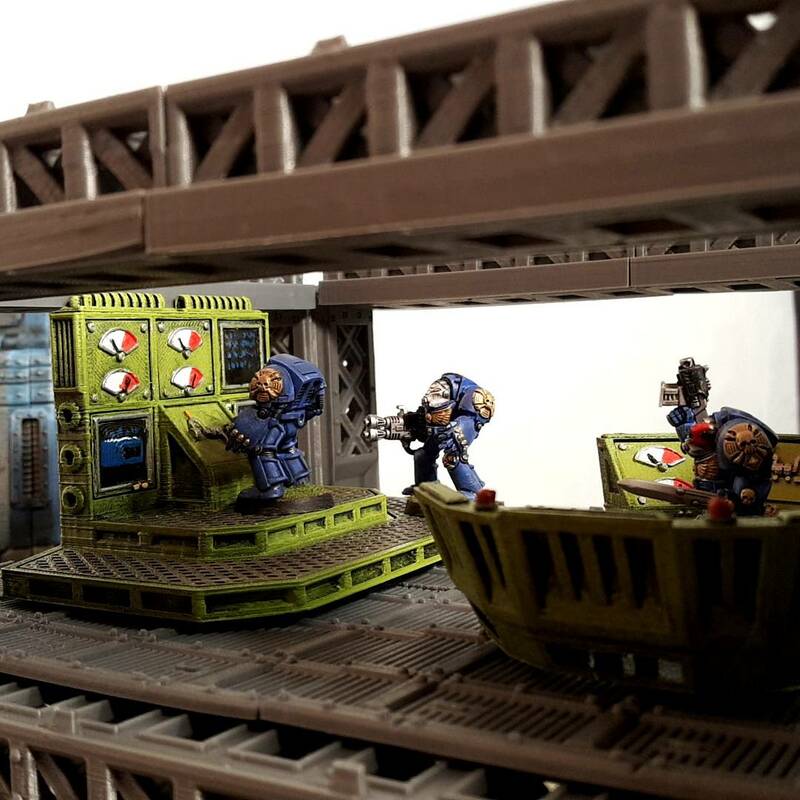 A steady stream of free 3D printable terrain models. So, how will it happen? Now that you have printed some nice terrain, you want to paint it. I will give you some tips from my own experience. This is the first part, dealing with equipment. If you have some experience on the matter, feel free to share them in the comments! If you have some questions, in the comments and I will try my best to answer them. 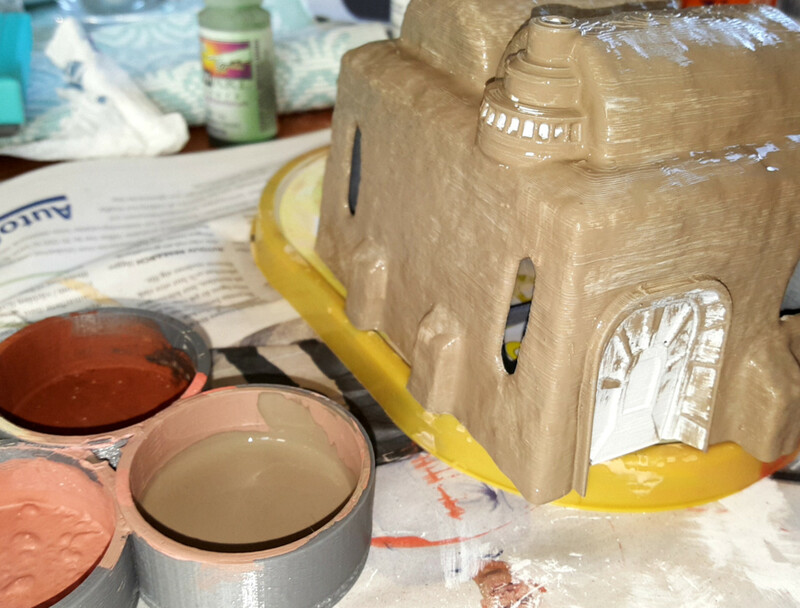 I use rattle cans to base coat my printed terrain. I have tried using an airbrush but it takes to long. Plus it is to fiddly. Good for miniatures though. Don’t use Army painter or Citadel spray paint for terrain. You can get a good spray paint for about a third of the price. 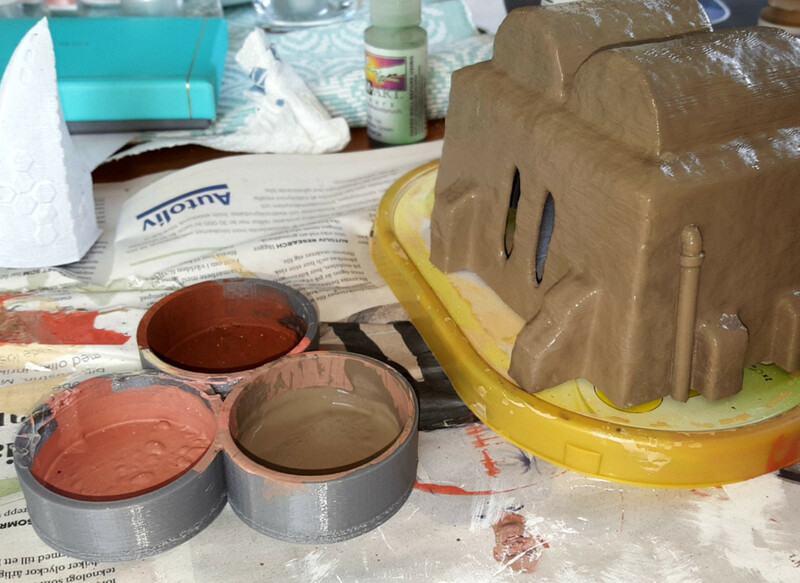 Priming lots of buildings really eats through your spray paint. Depending on what you paint, use a white, a gray or a black. To save time, you can also get a spray paint in the hue you want. But maybe you will need to coat it twice. I use house paint. It’s meant for walls indoor. The paint is a water based acrylics. It’s sold in home improvement stores or construction stores. You should be able to browse a palette with several hundred hues and pick the one you want. Then they will mix if for you. Ask for a tester pot. Where I live this is around 500 ml. Good to last you a very long time. The cost is about twice that of a citadel paint pot of 36 ml. You can also use hobby paint, or even miniature paint such as citadel, vallejo or army painter. But it will be more expensive. Sometimes you want to paint small details on the terrain, such as doors. Then a smaller pot is probably fine. Water is very good. You might find that battery water or distilled water (basically very pure water) is better than what you find in the tap. Use pure water to thin your paints a little bit. If you use house paints, you want it a very slight bit thinner. Pledge floor wax is a bit like a painting medium. It can be used to make washes. Painting medium is good to add to thinned paint. 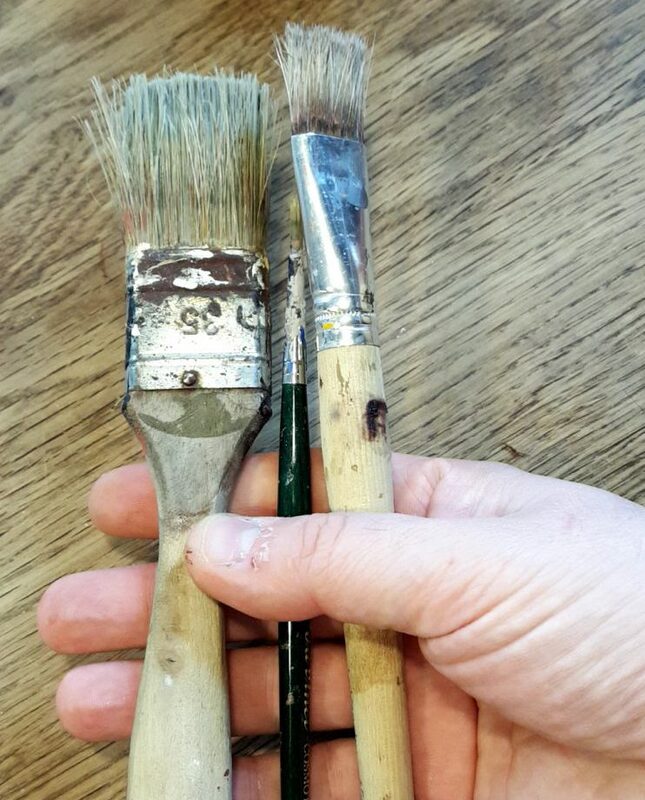 Brushes of different sizes. I use cheap brushes since painting terrain is a bit of torture. Cups of different sizes. 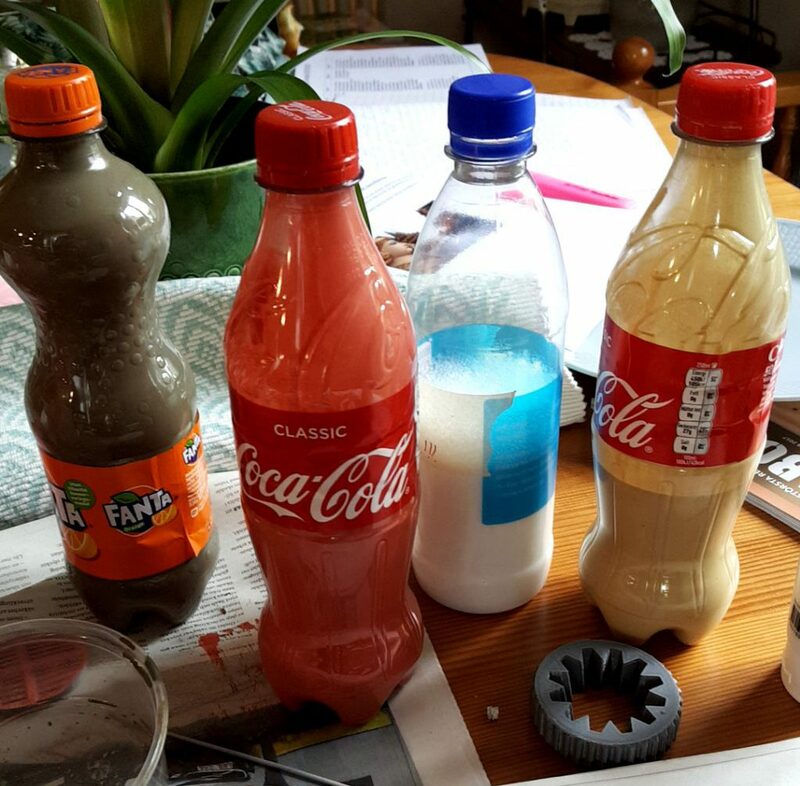 I use whatever I find in my recycling bin. Old ice cream jars for instance. Here is a palette I use myself. 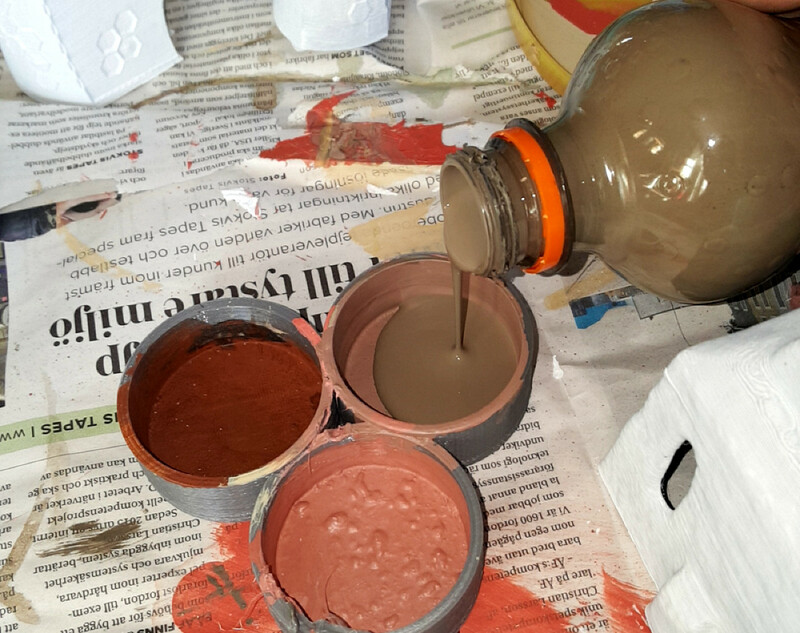 I pour my paint pots into PET bottles. I can then add some water and medium to thin it. The original metallic pot is not meant to be opened that many times to the lid will not fit very good after a while. The bottle show below works much better. If you want to leave it for a long period of time, you can seal it with some tape. To help mixing it, add a clean pebble or stainless steel bolt or washer. If you paint on the kitchen table, be sure to protect it. If you use a very wet thin paint, it can drip. It will also pool along the bottom of the terrain. Once it is dry it will have glued the terrain to the newspaper you have it on. So have something where the painted piece can rest and drip until dry. For instance, cut strips of extruder polystyrene (also known a pink, blue or yellow foam). I think you can guess quite a lot from that. I plan to start it in about one month. Here is a video of how the arms for the construction robot took shape. There will be control panels. Use them as objective markers or think up a fun scenario where the player controlling the control panels can control the the machines in the factory. Conveyor belts, huge machines, chemical pumps etc etc. There will be machines. This is the construction robot with the arm from above. There will of course be lots of other stuff too. This is just the beginning. If you like what you see, stay tuned. No, it is not mine. Eric Askue is a great sculptor and modeler. I consider myself a good modeler, but my sculpting skills are… not that good. Eric makes beautiful terrain with tentacles, alien eggs etc. I hope you haven’t missed the painting competition? The deadline is getting real close. 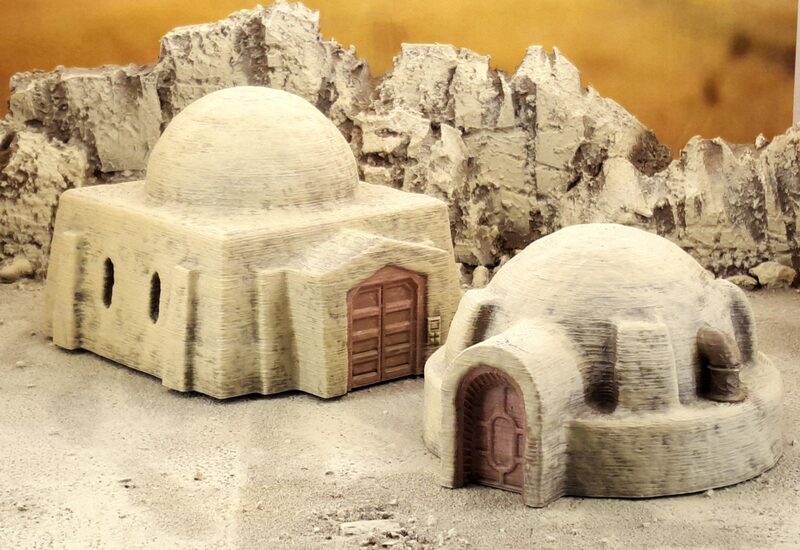 #3dprinted #wargaming #terrain from #terrain4print. Several houses from my shanty series stacked on top of each other. Nice 3D printed building from thingiverse. Not my design. Print as many as you like.